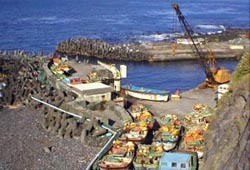 The economy of Tristan da Cunha is primarily based on fishing for crawfish or crayfish, marketed as Tristan Rock Lobster. Until rods became fashionable a few years ago, islanders would always use a hand line, thrown skillfully beyond the breakers with the aid of a home-made lead weight and usually baited with a piece of tough octopus flesh. These easy to carry hand lines were always taken on trips around the island, or to Nightingale, and to catch fish (for bait or food) whilst out fishing for crawfish. The most common fish caught close to shore is the delicious but bony 'five-finger'. 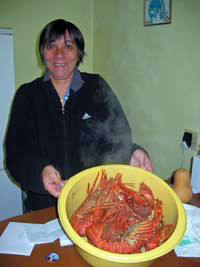 The Crawfish, Crayfish or Tristan Rock Lobster (Jasus tristani) is found in abundance around the Tristan islands and has been exploited commercially since the first canning factory was built above the former Big Beach in 1949 (see 1942-1961 History) before being destroyed by the 1961 volcanic eruption. (see 1961-1963 History). A new factory, incorporating freezing technology, was built after the islanders returned in 1963. This factory was destroyed by fire in 2008, but was soon replaced with an up to date modern factory, which remains the mainstay of the island's economy. The Tristan island crawfishing season starts on 1st July, with 2 teams of 18 fishermen using 9 large power boats on alternate days when weather permits. Each boat contains two fishermen who drop traps with imported bait to the sea floor with brightly coloured buoys bobbing on the surface to be raised twice a day by a winch, hopefully containing crawfish or octopus which are a by-product landed and processed in the factory. There is a catch limit quota, for the Tristan-based powerboats and around the outlying islands of Nightingale, Inaccessible and Gough by the fishing ships. In recent years this limit has been achieved by Christmas with no commercial fishing in until the following August. The factory starts work processing early as two boats ferry catches during the day prior to boats finally coming home with the remainder of the catch by 4pm. The crawfish, marketed as Tristan Lobster, are processed and frozen into three main products : Lobster Tails, individually graded, wrapped and packed into 10lb boxes within 50lb shrink-wrapped master cartons; whole raw and Whole Cooked Lobster, individually packed in 10kg master cartons. Factory oil-driven generators now produce electricity 24/7 to meet the demands of UN monitoring facilities recently installed on Tristan. Extensive work to upgrade facilities by the fishing company Ovenstone Agencies (Pty) Ltd., resulted in access to EU markets. Diners in Europe can now join their US (where lobster tails are mainly distributed to restaurant and hotel chains), Japanese (where whole cooked lobsters have been a traditional wedding dish and the whole raw product is favoured by resort hotels) and Chinese (a new market for whole raw fish) friends in sampling Tristan's luxury product. Nevertheless, there is nothing like freshly caught Tristan crawfish, now more readily available in the Settlement as the commercial fishing season finishes early and leaves islanders many fine days to launch a dinghy and bring back a catch like the one shown left. Lucky Tristan visitors may well be served crawfish caught the same day, hot or cold, particularly in 'crawfish tarts' served at parties. Gourmet diners across the world reading these pages are invited to contact the website manager with a photograph of a menu or an actual meal being served with Tristan Rock Lobster. The first Association member to eat Tristan Rock Lobster and report was in Las Vegas USA, and will be reported in the September Newsletter, but we await a photograph. Could be free publicity for a hotel and restaurant sending a JPEG photo and story. Contact : newseditor@tristandc.com .